Are you craving a luxury vacation? Then consider tropical Aruba as we share five luxury resorts for your consideration. Plus, this Caribbean island is only 18 miles from the coast of Venezuela, but it seems like a 1,000. Aruba offers visitors white, powdery sand beaches and gorgeous turquoise waters. In addition, there are countless indoor and outdoor activities to try. Watersports, shopping, sunbathing and gambling are amongst the more popular ones. The primary area of accomodations can be found on Aruba’s west coast. Visitors can choose from a variety of resorts and hotels. Also, there are numerous casinos to challenge “lady luck” and leave this island paradise a big winner. Today, we’d like to share five luxury resorts that are the best all-inclusive resorts in Aruba. So if you are looking for the best resort to stay at and enjoy endless luxury amenities, then you are in luck. Therefore, be treated right and enjoy a true VIP experience. Sparkling aquamarine seas lap sugar-white sands along the south and west coasts of this Southern Caribbean island, providing a distinct contrast to the semiarid, desert-like terrain of the interior and the north. Aruba has bounced among Spanish, Dutch and English rule, and today it is a constituent country within the Kingdom of the Netherlands. As a result, tall, multicolored Dutch colonial homes with wooden doors make for a picturesque sight in Oranjestad, the capital city. At each of the following five luxury resorts, the upfront rate includes accommodations, meals, drinks and activities. Whichever one you choose, you’re likely to hear a friendly “bon bini!” when you arrive. This means “welcome” in Papiamento, the native language. This 5-star retreat on the pristine sands of Palm Beach is our only all-inclusive resort in Aruba to offer a no-kids setting resort-wide. It has a gym, spa and water sports like windsurfing, snorkeling and kayaking. Plus the buffet restaurant features cooking stations and themed evenings. Lastly, there are four specialty restaurants and around-the-clock room service. For an additional fee, the staff can arrange a romantic dinner on the beach. Vacationers will find six restaurants, a lagoon-style pool and lighted tennis courts at this 4-star Palm Beach hotel. Join a game of water polo or a session of aqua aerobics. Also make use of the available snorkeling equipment or kayaks or join a scuba or kitesurfing class. Plus, inviting thatched-roof palapas and loungers line the palm-studded, white-sand beach. A stay at this 5-star retreat puts you within walking distance of Oranjestad’s lively center. A complimentary water taxi delivers guests to the hotel’s private, 40-acre island, which has no-kids and family beaches, private cabanas and food and drink venues. In addition, the resort itself also is divided between no-kids and family-friendly sections. Guests will find several restaurants, pools, a spa and an adjacent shopping mall. 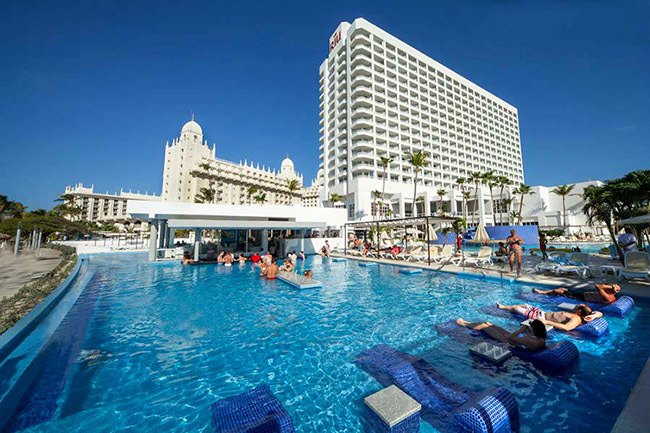 This property is next to the Hotel Riu Palace Antillas, and it welcomes guests of all ages. Among its draws are two pools, a swim-up bar, five restaurants, several bars and lounges and an ice cream parlor. Guests at the 5-star resort can enjoy live music in the theater, indulge in a massage at the spa or try stand-up paddleboarding on the waves. In summary, some suites even have whirlpools on the balcony. This 4-star resort is divided among three activity zones to match your vacation mood. Enjoy Peace & Harmony for those who want to renew body and mind through yoga or Pilates. Next is Action & Play for fun family time and pursuits like pool volleyball and aqua aerobics. Finally, Chill & Mingle for socializing and poolside relaxation. In addition, other amenities at this Palm Beach getaway include complimentary bicycle rentals, tennis and a fitness center. Are you ready to take your next luxury getaway to Aruba? Any of the five luxury resorts mentioned above would be ideal. As a result, be treated like royalty and make your vacation one to remember for years to come! The Life of Luxury can help you with all of your luxury travel reservations. We are here to assist you. We hope you enjoyed reading about the five luxury resorts in Aruba. Be sure to visit our luxury blog soon, for the best news and tips in the luxury travel industry.